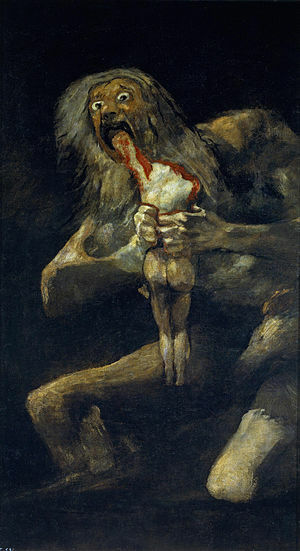 "If the authorities had only so much as considered an online search, it would have been clear that the painting is still housed at the Prado", said the artist Sanjeev Khandekar, about a canvas, supposedly Francisco Goya's Saturn Devouring His Son, confiscated by the police from the home of a real estate agent named Majeed Sultan Khan. Sanjeev is absolutely right, the police should have done a basic check. But since I believe it's impossible to underestimate the competence of our investigative agencies, I'm not surprised the cops felt they'd found a 19th century masterpiece in an Oshiwara tenement. Instead of pointing a finger at the police, though, shouldn't the Times of India question the decision by its editors to feature the story on the front page yesterday? Why didn't the writer of the article, Vijay V Singh, google 'Francisco Goya' himself? I mean, if the police announce tomorrow they've found the original Mona Lisa in a Goregaon shanty, will the Times take that at face value and put it on the front page as well? You end with a rhetorical question, yes? Because it is equally impossible to underestimate the competence of our press, I'd have thought, no? Ashish, I'm trying to resist that conclusion, and therefore didn't mean it as a rhetorical question. But I do wonder if feedback mechanisms established by Indian media organisations are much better at detecting incompetence than such mechanisms in government agencies. I'd say they (the media) are much better at detecting incompetence... on the other hand, both entities are equally reluctant to do anything about it, once detected. I was suprised that the police guys even figured that this painting could be of any value. I would have expected them to stare at the "ugly" painting thinking that the owner is a pervert and then proceeded to work as usual.